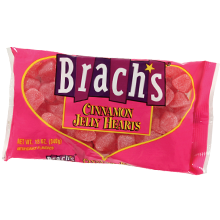 Brach's Cinnamon Heart the perfect Valentine candy for those who like things a little bit spicy. You get a heart shaped jelly candy with a cinnamon flavor then dusted with a light coating of sugar. You can't go wrong with chewy, sweet and spicy that's for sure. These are one of those candies that are great to eat right out of the bag, but you can also use them to decorate your Valentine baked goods. One of the best things about these hearts is although they are a bit spicy and have a great cinnamon flavor they are not scorching hot like some cinnamon candies. We have many customers that love the cinnamon hearts so much that they will buy 12 or 15 bags so they have them all year long. Or for as long as that many bags will last them. Another thing our customers like is that there is no fat or sodium in these hearts. 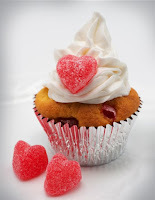 Here is a cute idea for using cinnamon hearts on your cupcakes. Just make your favorite cupcake add some fondant and drop on a candy heart. You can buy cinnamon hearts in a 12oz bag if that isn't enough just buy more. Smarties. Still the same sweet and tart flavored candy. Love hearts are not your typical candy Conversation hearts even though they have cute and sassy romantic saying. Instead of being shaped like hearts they are round like all Smarties then have a raised heart with the message in the middle. Besides the typical romantic sayings : Kiss, Be Mine, Marry Me, and Hold me there are some new sayings for the youth of 2019. A few of the new sayings are : Text Me, Swipe Right, On Fleek and BAE (Before Anyone Else ). Let's face it when it comes to conversation hearts, they traditional ones just don't appeal to the kids. The like sour candy or gummies. I have to admit these are one of my favorite conversation hearts. I won't even tell you how many boxes of these I have eaten this season. 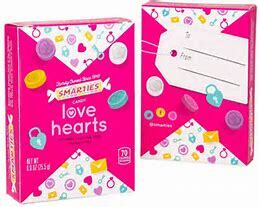 Smarties Love Hearts now come in .9oz boxes with about 20 candies in each box. They are perfect for handing out for your valentine exchanges or parties. There is a spot on the box to write to and from. This year when trying to decide what to get for your valentine buy Smarties Love Hearts and score big with your special someone.